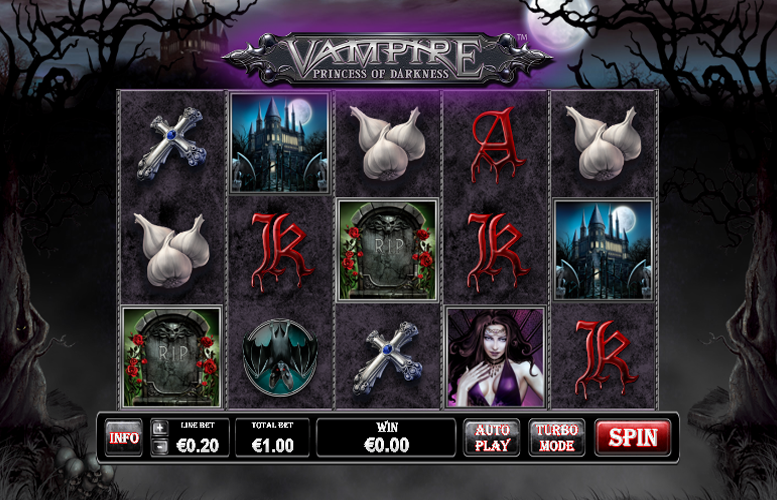 Vampire Princess of Darkness is a slot machine tailored for all those iGamers of a gothic disposition. The title is dark and macabre, as you’d expect for a game based around monstrous blood-sucking chicks. The artwork for the game is particularly strong and those who enjoy the gothic-inspired designs will almost certainly get a kick out of this game by veteran slot design team Playtech. Likewise, the soundtrack compliments the visuals well to create a title with a strong feel – perfect for a punt around Halloween. The title’s standout feature is certainly its massive main game prizes. These are some of the largest we’ve ever seen. This is fortunate since the game lacks in the way of excitement-adding bonus modes. There is one but it is a basic “pick-a-box” style feature, which in 2019 is hardly going to impress us. Great artwork and music. This gives the Vampire Princess of Darkness slot machine a suitably spooky feel! Massive main game prizes. We love being able to drop such big payments from a single spin. The top prize of 7,500x the line bet is certainly worth getting excited about! Disappointing lack of bonus features. 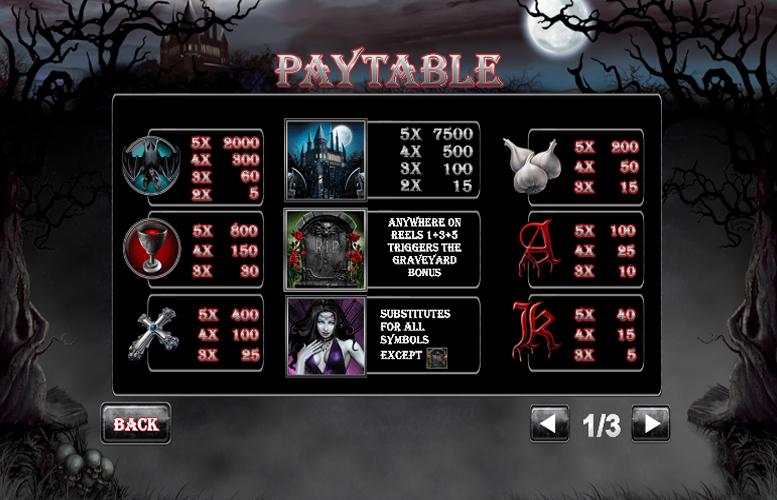 Given the slot’s spooky theme, there are plenty of opportunities to include innovative bonus features. For one, not being able to get up close and personal with the sultry vampire chick feels like a missed chance for added excitement. 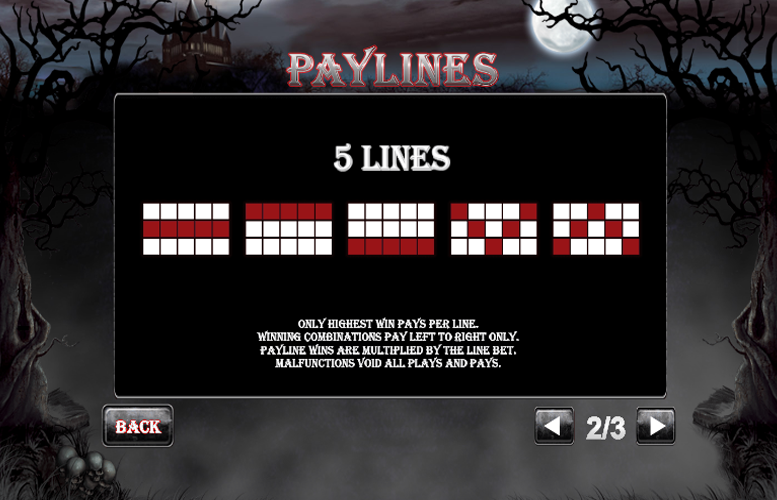 The largest payments on the Vampire Princess of Darkness slot machine are awarded for matching five of the same high value symbols along one of the five win lines. These symbols are represented by typical imagery associated with vampires. Vampire Mansion = 7,500x the line bet. Vampire Bat = 2,000x the line bet. Goblet of Blood = 800x the line bet. Crucifix = 400x the line bet. Garlic =200x the line bet. Landing three gravestones anywhere on reels one, three, or five at the same time will trigger the Graveyard Bonus. 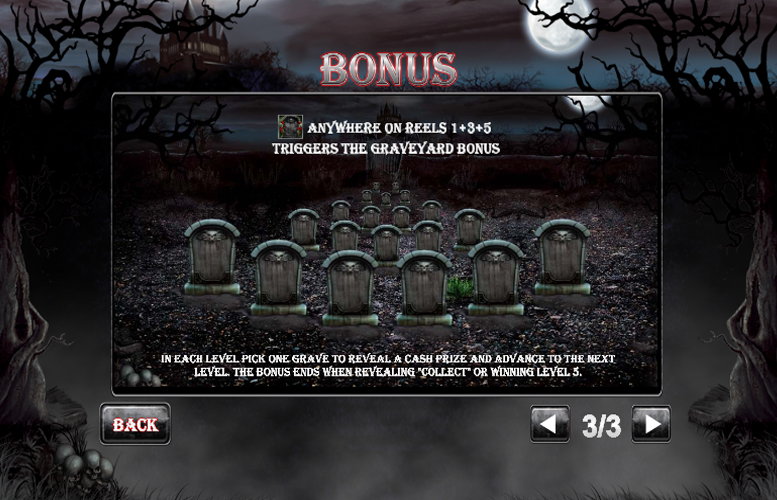 During each level of this special bonus feature, players must select one of the graves to reveal a cash prize. This will also make them advance to the next level of the Graveyard Bonus. The feature will end once a player wins the fifth and final level, or they discover the “Collect” symbol behind one of the tombstones. At the end of the feature, all winnings will be added to the player’s available balance. In addition to the higher value symbols on the Vampire Princess of Darkness slot machine, there are also those that don’t award such grandiose prizes. As is common on online video slots these days, these lower value symbols are each represented by a playing card from the upper end of a standard deck. However, they are depicted in blood, which makes them thematically relevant! Ace= 100x the line bet. King = 40x the line bet. The number of win lines is fixed at just five on the Vampire Princess of Darkness slot machine. This means that players are only given the opportunity to adjust the amount bet on each one. The minimum value here is just 1p. Meanwhile, the maximum is £20. This makes the lowest possible bet per spin just 5p. Conversely, the largest possible bet per spin is £100. Whilst clearly not the biggest upper betting limit we’ve ever seen, all but the highest rollers around should find it more than accommodating enough. All things considered, the Vampire Princess of Darkness slot is ideal for those who love Vampire stories or gothic culture. It will also likely appeal to gamblers that like to win big off single spins rather than playing elaborate bonus features – unfortunately that isn’t us. We love side games and get a real kick out of particularly innovative ones! This is where this title really lets itself down. The single game feature is a standard one on many slot machines. In conjunction with a second bonus mode, it would work fine but standing alone it doesn’t add enough to the slot’s gameplay dynamic to make the title one of our all-time favourites. That said, the artwork is fantastic throughout the game and fans of classic tales of horror are recommended to give Vampire Princess of Darkness a try for themselves. This game has a rating of 3 / 5 with 293 total reviews by the users.